Happy December to the Healthy Wealthy and Smart family! 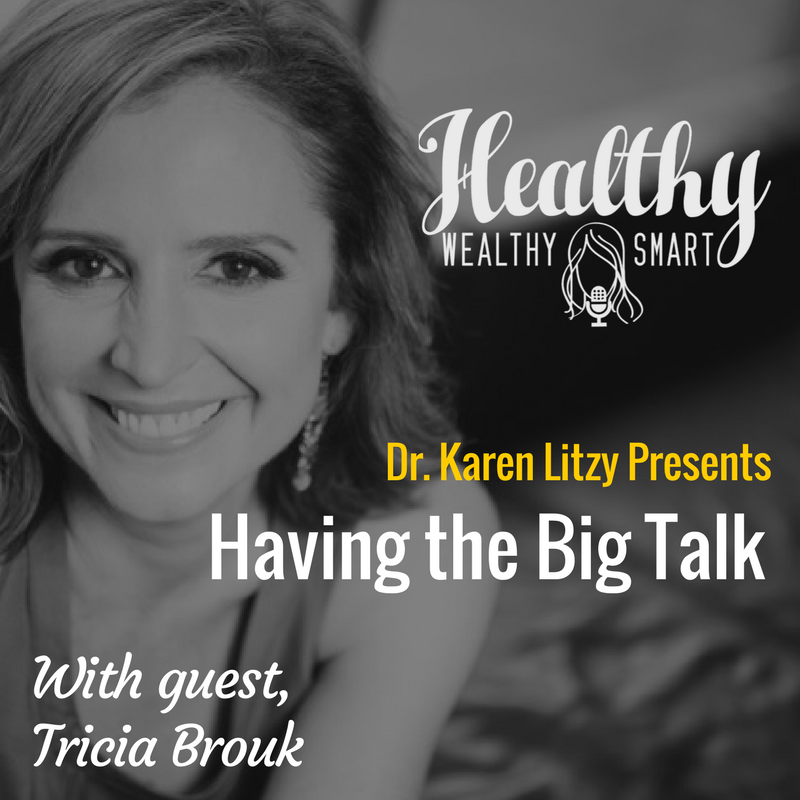 On this episode, I welcome Tricia Brouk on the show to discuss the elements of a memorable big talk. In addition to working in the entertainment industry, Tricia Brouk applies her expertise as a director and writer for film, television and theater to the art of public speaking. She’s the executive producer of TEDxLincolnSquare and has choreographed Black Box on ABC, The Affair on Showtime, Rescue Me on Fox, and John Turturro’s Romance and Cigarettes. The series she directed, Sublets, won Best Comedy at the Vancouver Web-Festival. She’s written two musicals, a play, a sitcom pilot, and a feature film. She’s been featured in Inc. Magazine, Huffington Post, Broadway World and has been a featured guest on Leaders In The Trenches, Ultimate Leadership, EO Fire, and Weekly Alignment. She also hosts the podcast, The Big Talk on iTunes, where she interviews people who talk for a living. Tricia Brouk draws on experience as a TEDx organizer, a writer, director and choreographer in film, television, and theater to help you bring your life-changing talk into focus. Her unique point of view will get you onto the big stage and guarantee you an unforgettable big talk every time. I view public speakers through the same lens I do an actor. You have something important to say and it’s my job to help you find the way to say it with truth, confidence, vulnerability, awe, compassion and courage. With the help of my direction and guidance, I’ll bring your life-changing speech into focus, while giving you the unique insight into what makes an unforgettable big talk. I’ll break down your script just like I do with a film or play. I’ll identify the arcs the beats, and if what you are saying is actually what you mean to say. I’ll identify what you need to do for your big talk or your Keynote, as they are very different. Once I do that, we’ll work together on clarifying, specifying and performing your big talk through blocking, repetition, and simple techniques I use with actors. My goal in the room is to create a safe space so you can drop in. When you are working on the material, I’ll help you find new and interesting ways to communicate your very important talk. Once we find those, together, I will help you maintain the integrity and consistency of the performance so you can be free to talk to the audience, like you’re talking to a friend. I will help illuminate the importance of what you, as a speaker, want to say and how you communicate that information so that your audience leans in.